Aviva has more than £920 million invested in companies developing new coal projects and operating in the tar sands industry, despite its support for the Paris Climate Agreement, Unfriend Coal campaigners warned today. In a briefing released ahead of the insurer’s annual general meeting they said its policy of engaging with companies to drive change had had “no meaningful successes” and that as of November 2017 Aviva was financing developers planning to build 90GW of new coal power. Aviva began engaging with 40 coal companies in 2015, and this included asking whether they had “any plans for new investment in coal generating capacity, as we believe this in particular would go against our approach to helping meet the Paris Agreement of limiting global temperature rise to well below 2 degrees Celsius”, according to the insurer’s climate-related financial disclosure 2017. However, in November 2017 the insurer was the second biggest investor in PGE with £146 million ($198 million) of shares, including £90 million ($122 million) through its Polish pension fund OFE. PGE is Europe’s second biggest CO2 emitter and the continent’s largest coal power developer, with plans to build 5.2GW of new coal plants. Aviva has £458 million ($621 million) invested in 31 coal plant developers, including 11 which plan to build more than 90GW of new coal power – more than six times the British coal fleet. 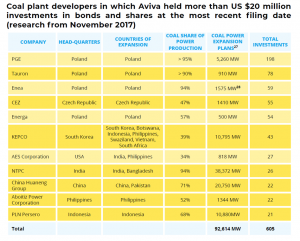 Aviva’s Polish pension fund OFE has increased its holdings in Polish coal companies, which plan more than 8GW of new coal power plants, from £272 million in 2015 to £371 million in 2017 (€310 to €422 million). Aviva has £19 million ($26 million) invested in India’s National Thermal Power Corporation, which plans to build 38GW of new coal power, making it the world’s biggest coal plant developer. Aviva has over £469 million ($634 million) invested in companies operating in Canadian tar sands or planning to build major tar sands pipelines. Sixteen major insurers have announced plans to divest more than £16 billion from coal. AXA has announced that it will divest from companies which plan to develop new coal projects, as well as from major pipelines and tar sands production companies. Aviva and Coal, A Very Long Engagement identifies three major weaknesses in Aviva’s climate strategy. Unfriend Coal says the insurer should focus on a small number of companies with real potential to transition away from coal and tar sands within a year. It should automatically divest from companies planning new carbon-intensive projects as these are unlikely to align with Paris climate targets. Polish Coal. Aviva claims that Polish law requires its local pension fund OFE to invest in Polish coal companies. However, the briefing reveals that, although local pension funds must invest 70% of their assets in assets denominated in Polish currency, the law does not set a level of investment in individual companies. It contrasts Aviva’s OFE, which has 4.42% of its customers’ assets invested in Polish coal, with Allianz’s Polish pension fund, which has just 1.94% invested in the sector. Unfriend Coal calls on Aviva to make use of flexibility in the pension funds law. Third party assets. Aviva does not apply its divestment policy to assets it manages for third parties and the briefing suggests that this may be part of the reason why it continues to be so heavily invested in companies actively developing coal power. Unfriend Coal calls on Aviva to follow investors like AXA and Zurich and apply its divestment policy to both its own assets and third party assets. Aviva’s climate-related financial disclosure 2017. Aviva has told Unfriend Coal it is divesting £11 million from the 15 companies.